170 other birds have this item in their bag or wishlist! This Hammamas Original Towel is a soft colourful accessory that will soon become your go to piece. The tasseled fringe is hand finished in an age old Turkish tradition by women in rural Turkey. My whole family loves these. Lightweight, dries quickly, multiple uses. Can't wait to buy more! Very happy with purchase. Love the colour. A present for my daughter, hope she likes it as much as I do. Hope it softens when washed as describe in reviews. I LOVE my hammamas. Have used it as a beach towel, sarong, picnic blanket, privacy screen, snoozing blanket in cooler weather, it really is so versatile and quick drying. Perfect for travel. Good light weight towel for travelling if you want a real towel rather than a travel towel and is multi purpose - beach sarong and beach towel! This is an awesome pool towel, it dries so quickly and is ready to be re-used multiple times in a day. Nice fabric and colour! These are wonderful towels. They have washed well (no fading or shrinking), they are lightweight, and are very absorbent. Great for my kids, who are in and out of the pool all day, it dries really quickly. I brought this towel as a 'just in case' present. I figured it's a unisex colour and a gift that I could happily give to literally any age. Very handy- doubles as a beach towel, sarong, tablecloth. Gorgeous colour and easy to pack. Absorbent too! These 100% cotton towels are just amzing! Very thin and has a very soft feel to it. 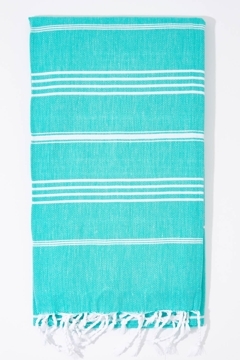 Perfect for a picnic rug on a towelat the beach! Unbeatable price!